Football Federation of Tuva was adopted yesterday into the All-Russian Football Union. It's an important step certifying that after over 10 years of stagnation soccer in the republic is reviving. 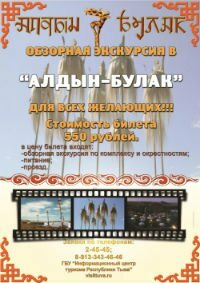 The play was brought to Tuva by the first specialists from Russia in the 30-ties of the last century and the play on the Tuvan sandy soils reminded that of the soccer played in Brazil. There were hundreds of football teams and football clubs. 6 young karate-sportsmen from Tuva took part in the All-Russian competition for the Karate Federation Prize, which has been held in Moscow. Amir Munzuk won the gold medal among 12 and 13-year-old boys. His coach is Chingiz Aliev, 21. Tuvan music expert Valentina Suzukei takes part in the international conference in Taipei. Seventeen domestic and foreign scholars and experts are attending the two-day conference to discuss interactions and exchanges between Mongolia and three Mongolia-descended republics of the Russian Federation -- Tuva, Buryatia and Kalmyk -- from the perspectives of politics, economics, regional security and culture. Tuvan Orchestra of traditional instruments, founded in April, 2003, has become a prize-winner at the All-Russian Contest among folk ensembles and orchestras which has just finished in Saratov. 940 musicians from all over the country took place in the event which is held every ten years and is carried out by stages - in a region, in a zone, and in the finals. Tuvan orchestra won the right to represent Siberia two years ago at the zone stage in Krasnoyarsk. Chadan hosts hundreds of visitors this week-end. 240th anniversary of the historical Daa kozhuun is being celebrated on a large scale with khuresh wrestling, concerts, horse-races. The date was discovered in the archive chronicles ten years by Kyrgys Arakchaa who knew the old Mongolian letter. Daa's 'birthday' happened 7 years after the Tsin dynasty occupation in 1758. The kozhuun at that time embraced the Northern parts of the Bai-Taiga, Dzun-Khemchik, Sut-Khol and Ulug-Khem districts. The press release of the Russian Service of Protection of Consumer Rights and Welfare says that tuberculosis claimed over 200 million lives since the 1990s and the figure keeps growing. In 2004, 102,887 active (pulmonary) tuberculosis patients were registered in the country, and the disease rate was 71.7 per 100,000 of population or 3% more than in 2003. Tuvan Orchestra of traditional instruments takes part in the All-Russian Contest among Ensembles and Orchestras of National Instruments which is held every ten years. This time it takes place in Saratov. Tuvan musicians won the right to perform in the final on behalf of the whole Siberian region 2 years ago at a zone stage of the contest which took place in Krasnoyarsk. But their trip to Saratov was under the question till the very last moment as they could not find the whole sum of over 200 000 rubles for the transport expenses of 28 musicians. Major General of the Chinese People Liberation Army, Commander of the Provincial Military Region of the Inner Mongolia Juan Gao Chen has arrived in Kyzyl following his talks in Novosibirsk. There he signed with his counter-part Igor Kurilov an agreement on the copperation between the Provincial Military Region of the Inner Mongolia and the Siberian Frontier Management. The agreement covers the frontier issues. 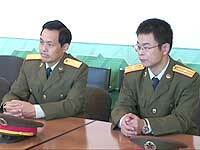 But as Kurilov noted the Chinese stretch of the Russian border line is one of the calmest. Today is a Stone-Carver's Day, but this date is not officially marked in the calendars. It is an informal holiday which was suggested by a group of Tuvan masters on the Saryg-Khaaia mountain (Bai-Taiga district) almost ten years ago. Every September stone-carvers go to Saryg-Khaaia agalmatolite site, the only place where chonar-dash (soft stone) is purchased. The gathered stone lasts them a year till the next trip in Autumn. The first after the summer vacations parliamentary session stopped short after the minister of finances did not come on the deputies' invitation to speak on the government work at the new republican budget. The deputies were indignant at this attitude to the legislative power. Deputy Kaadyr-ool Bicheldey said that we are eager to cooperate with the Government but it should be a two parties movement.